"The bank building on the northwest corner of Main and Chestnut Streets was built in 1902 by both the Wakefield Savings Bank and the Wakefield National Bank. The site was formerly the John Raynor homestead which was built in 1775 and eventually torn down to make way for a new home for Daniel Norcross. The house was destroyed by fire in 1857, and eventually the land was occupied by Mrs. Hannah S. Brown. The First National Bank bought the land in 1900. Both banks occupied the building until 1924. The Wakefield National Bank, incorporated as the South Reading Mechanical and Agricultural Institution in 1833, was organized as a state bank, the South Reading Bank, in 1854. It was reorganized as the National Bank of South Reading in 1865 and changed its name to the Wakefield National Bank in 1902 and to the Wakefield Trust Company in 1916. 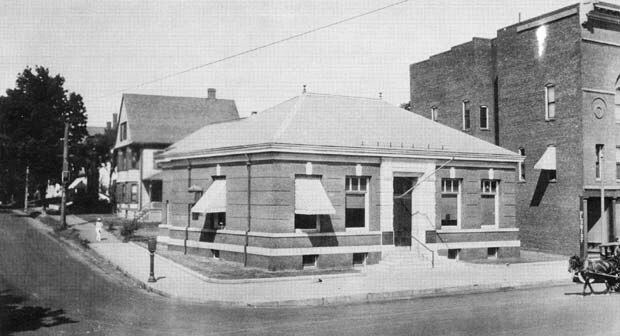 The bank moved to the adjacent corner of Main and Chestnut Streets in 1924 when a new building was completed under the direction of President Junius Beebe. The Wakefield Savings Bank, now The Savings Bank, received its charter from the Commonwealth on May 26, 1869. Cyrus Wakefield was elected as the bank's first president and its offices were shared with the Wakefield Real Estate & Building Association in the Brown Building. The bank later moved to the Wakefield Block (the Taylor Building) and the Flannery Block (the Odd Fellows Building) until the new building was erecetd in 1902. In 1924 when the Wakefield Trust Company moved across Chestnut Street, the Wakefield Savings Bank acquired the whole building and shared its space with the Wakefield Municipal Light Department. The building underwent extensive renovations in 1939." -- Text from calendar by Jayne M. D'Onofrio. “Wakefield Savings Bank, Main and Chestnut Street, 1923,” NOBLE Digital Heritage, accessed April 22, 2019, https://digitalheritage.noblenet.org/noble/items/show/7156.